Why is the European Commission willing further to experience the obvious paradox of pursuing contradictory goals, according to which a successful future of the EU Energy Security Strategy becomes too dependent on a very fragile and shaky energy independence of Ukraine? Brussels' obstinate attempts to lead Ukraine to an alleged energy independence from Russia are something of another apparent paradox. It hardly needs disputing ultimate truth that the required level of energy independence can be achieved only if the necessary measures are being taken by the Government in order to overcome the lack of self-sufficiency in primary and secondary energy resources. A majority of countries are seeking to somehow maintain and develop their own energy potential primarily using its domestic opportunities. Ukraine is a rare exception to this common rule, since this country has been continually preoccupied with economic and financial crisis as well as continuous political infighting. From the very beginning, Ukraine obtained a very good start-up potential of its energy sector. Historically, Ukraine at once inherited the most developed part of the Soviet energy industry, which, for example, included four nuclear power plants with 15 reactors. There was Europe’s largest nuclear power plant in Zaporozhye amongst them. It is regrettable that now Ukraine illustrates the old French proverb, "soon gained soon squandered." Speaking at the VI National Expert Forum in Kiev Ivan Plachkov, the president of the All-Ukrainian Energy Assembly and former energy minister of Ukraine stated that Ukraine has never been so energy dependent, as it is now. "The key issue in the energy sector today is energy security and energy dependence that we have," he pointed out. It would be hard to imagine how the EU policy makers can fail to notice that over the 25 years of its existence, Ukraine has halved own oil and gas production, heat-and-power system has become dependent on external supplies of coal and Ukrainian nuclear power sector has continued to accumulate the debts. Along with that, the GTS of Ukraine represented as one of the largest gas transmission systems in the world has mostly crossed the threshold of the required environment friendly usage period. High-ranking officials of the European Commission involved in the of EU energy security policy development unfortunately continue to be influenced by the illusions that reverse gas flows that are pumping Russian gas back eastward to Ukraine is the most effective way to ensure the Ukraine's energy independence on a long term basis. Moreover, they believe that such measures on recovery of Ukraine's energy independence are also a good deed in favour of the energy security of EU countries. It has been already recognized that reverse supplies give a certain political effect, which is especially sought by our partners across the Atlantic. Reverse operations also provide business opportunities for a number of European companies - gas traders. But we must not forget that all of this can happen only, if the EU countries have a substantial surplus of natural gas in their own markets. In practice, this is a complex issue focusing in particular on strong seasonal patterns of demand. 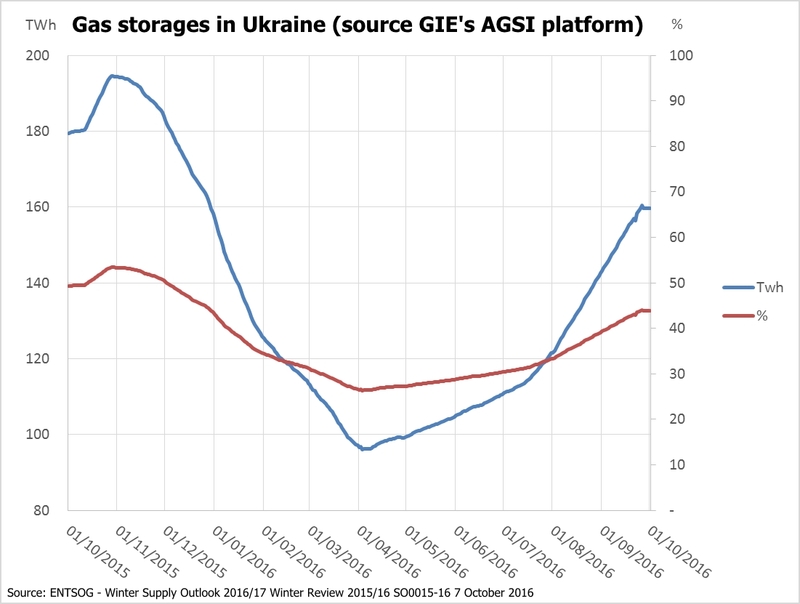 According to Winter Supply Outlook 2016/17 published by ENTSOG on 7 October 2016, this year the level of storages across Europe significantly contributes to the balance of demand across the season. ENTSOG also assured that there is the ability to physically send gas to Ukraine. Apart from ENTSOG optimistic estimates, particular attention needs to be given to other circumstances, which identify areas of concern related to higher transit risks to gas supplies this year. To begin with, a new long-term forecast from Accuweather has predicted a significant cold shot or two during the second half of the winter season. Therefore, relatively mild and short winters can hardly be expected in the most of EU countries. Meanwhile this forecast suggested that a number of days with "snow or ice" would be relatively small. For example, forecasters predicted five of those days in London that 10 times less than in Kiev. A comparison with Ukraine is done on purpose to show that although the forecast promises Europeans a comfortable winter, such a substantial difference in the duration of expected cold shots in the EU countries as compared with Ukraine might lead to unintended consequences for our energy security. As many know, Ukraine uses the same underground gas storages (UGS) both for providing gas transit to the EU, especially covering seasonal unevenness of gas consumption in Europe, and also for meeting a current demand in the domestic market of Ukraine. 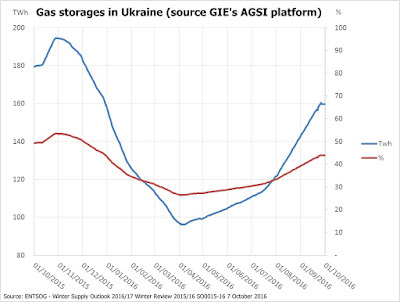 In that regard, what is more worrisome is that Ukraine started this winter season with much lower actual inventory level of the UGS as the graph below displays. This year the capacity of Ukraine’s underground storage facilities are filled less than half of their designed volume. According to state gas-transportation company UkrTransGaz, the process of gas injection was stopped on 16 October and at once Ukraine started withdrawing from its UGS facilities. To that date, the accumulated volume of total gas in storage was 14.75 bcm, which is only 48% of total natural gas storage capacity - the maximum volume of natural gas that can be stored in these storage facilities in accordance with its design. As a comparison, before the previous two winter seasons began Ukraine had had significantly larger gas reserves in its USG. The country entered the winter season 2015-2016 with the accumulated volume of total gas in storage of 17.1 bcm and finished it with a margin of 8.4 bcm. The winter season 2014-2015 started with total gas in storage of 16.7 bcm and ended with a volume of 7.6 bcm left in the UGS. Besides, it should be taken into account that before the considered two winter seasons Ukraine still imported natural gas directly from Russia. Anyone in Europe, who would pay attention to this tense situation, could come to conclusion that now the EC countries are facing many other much more serious challenges to deal with instead of bearing the undue burden of Ukraine's energy independence. The EC also needs to keep track of a scandalous misuse of funds provided by the EBRD and other international financial institutions allegedly for supporting the energy sector reforms in Ukraine, which in fact is doomed to failure in conditions of energy degradation and rampant corruption. As recently noted by an international energy expert Edward Chow in Financial Times, "Ukraine’s track record of massive corruption in energy is a sadly familiar story." Is that not a paradox to continue funding corrupt officials in Ukraine? What if we do admit the veracity of Oscar Wilde words, "The way of paradoxes is the way of truth" from The Picture of Dorian Gray, then it is time finally to get to this truth? Anyway, it is more likely that the paradoxes of the EU policy concerning implementation of the Energy Security Strategy outlined above and in the previous post will seriously remind about itself not just once over this winter. Of course, all of us would like to be optimistic about the future. Why can't Europeans hope that at least the encroaching winter cold spell has to cool down the heads of those who are inclined to take to the paradox such basic economic concepts as gas demand forecast, cost-efficient way to transport gas or energy independence in order to cover up just the political goals?